Leonard Nederveld wa 19 years old when he stormed ashore on Iwo Jima on February 19, 1945. On D +5, he threw a grenade into what he thought was a Japanese bunker. Turned out it was an ammo bunker. The explosion peppered the left side of his body with fragments and knocked him unconcious. The corpsman, thinking he was dead, did not advance through heavy fire to treat him. A day later, Nederveld woke up and began to crawl back toward his unit. Seeing movement crawling toward them, a couple Marines thought he was a Japanese soldier and were getting ready to shoot when another Marine shouted, "Don't shoot, that's a Marine!" Nederveld was evacuated to a hospital ship. He lost hearing and vision as well as some mobility on his left side from his injuries. After 11 months in the hospital, he was discharged from the Marine Corps. He said most of the men in his company that survived Iwo Jima were later killed on Okinawa. After being discharged, He used the GI bill to go to college and he became a Certified Public Account, got married and had 5 children. For many years, he and several other World War II veterans would volunteer at the World War II Museum in New Orleans. 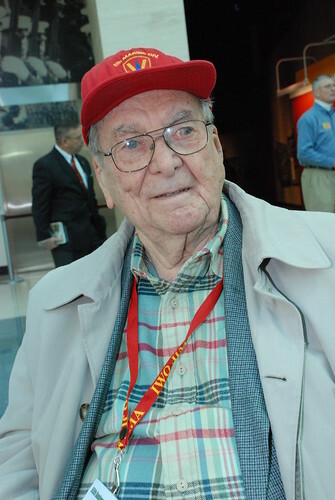 He is currently the 5th Marine Division Reunion President.